When financial news refer to the stock market they actually mean the S&P 500 or the Dow Jones. The S&P 500 index represents the 500 biggest and most profitable companies in the world. The Dow Jones represent the 30 biggest companies that act as a bell weather to the US economy. The Nasdaq represents the technology stocks in the market. Together they are known as the general market. The main reason why you should follow the general market is because at least 75% of the stocks in the market follow the direction of these 3 indexes. If the S&P 500 index is up 1% for that day, 75% of the stocks in US will also be up. If the S&P 500 index is down 1 % for the day, 75% of the stocks will be down as well. Periods of rising stock market usually coincides with the biggest bull run in stocks. In the chart above, you can see that the S&P 500 Index rose from November to December 2016. This was just after the Presidential Election and the market rose dramatically after the uncertainty of an election. 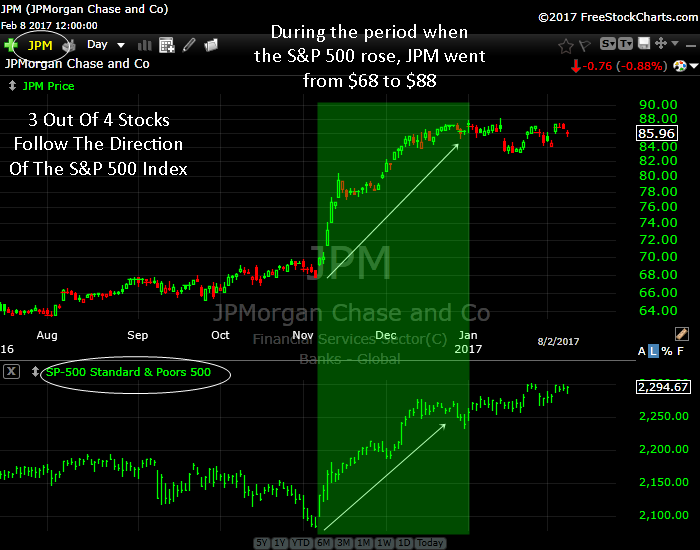 JP Morgan, a bank stock rose from $68 to $88 in that short period of time. Or is the S&P 500 in a trading range? Is the S&P 500 breaking out or breaking down? If you can answer these questions you will be able to position yourself for some of the biggest move in a stock.